The baroque black and silver meridian is made on a solid beech frame with fine sculptures, upholstered with velvet fabric for high-end furniture. The baroque black and silver meridian symbolizes opulence and comfort, it is perfect to decorate your living room. 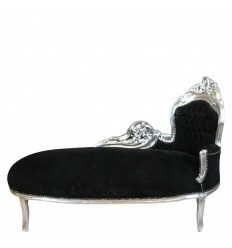 A beautiful Rococo velvet fabric lines the back and seat to provide a soft and voluptuous seat. Built on a solid silver beech wood structure, ornamented with fine sculptures made by hand following the rule of the traditional art of cabinet making. To sublimate the interior of your home, especially the living room or bedroom, in a sleek and luxurious way, this sumptuous Baroque chaise is an ideal seat. This piece of furniture from another era has a structure mainly made with the best quality wood, including massive silver beech, decorated with hand-crafted sculptures in a very artisanal way with various patterns taking the style. 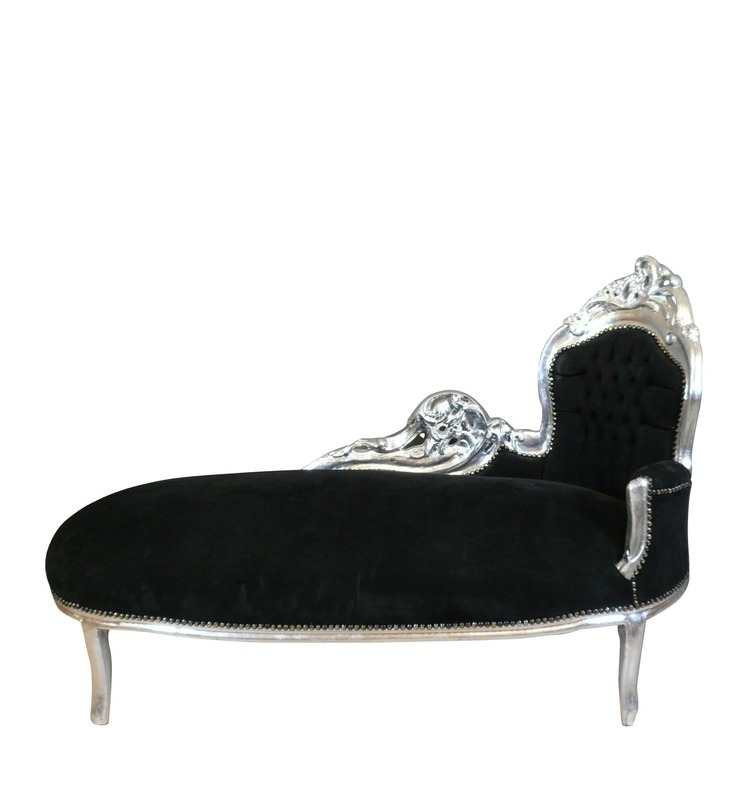 It is a Rococo style seat, extremely popular in palaces, castles or mansions. Furniture of this kind symbolizes the wealth and prosperity of the owner. Its short backrest and long seat allow the guest to lie down or sit down. The back and seat are covered with a beautiful velvet fabricBlack cotton, seamless studded to the structure with upholstery nails to provide user-friendly comfort. They are padded with high quality foams, to provide a soft seat. As for the assembly and the finishes, they are made in an old way with the most precise craft techniques. The baroque black and silver meridienne is part of Rococo furniture styles, as its name suggests. It is a concept originating from Rome, the capital of Italy, which means a "rare pearl". It developed in the sixteenth century to touch later painting, sculpture, music, architecture but especially furniture. Inspired by Gothic and Baroque art, this piece of furniture is characterized by its curvaceous and arched structure in general, which gives it a rare elegance and infinite beauty, a great option to give you the opportunity to live like at home. Castle of Versailles. Apart from aesthetics and comfort, these chaise lounges have excellent strength and solidity, to help you relax for many years.